French food has been good to Joël Robuchon. The things he can do with the cuisine of his homeland have helped make him the most Michelin-starred chef ever, with 18 stars in his global group of restaurants, which includes six venues in Japan  more than in any other country. Now Robuchon has opened his first overtly Japanese restaurant, at the Hotel Metropole in Monte Carlo, and it's exactly the chic coup de main his fans would expect. With Yoshi  derived from the Japanese oyshi (delicious)  Robuchon celebrates his love of Japanese culinary culture while keeping his interpretation characteristically idiosyncratic. "My concept is to serve authentic yet modern Japanese cuisine attuned to a French sensibility," he says. "Freshness of produce is paramount, as is correct technique that accentuates the pure essence of each ingredient." But "certain jellylike textures and fermented sauces intrinsic to Japanese cuisine won't feature, as they simply wouldn't appeal to the Western palate," Robuchon adds. Yoshi's head chef Takeo Yamazaki, whose CV includes not only Robuchon's Tokyo establishments but also the kitchens of Paul Bocuse and Alain Ducasse, has put together a menu that mixes the unexpected with more familiar modern Japanese dishes. Sakizuke (appetizers) include an ethereal bonito custard flavored with sake and topped with an intense gelée of dried shrimp, sake and soy. The light, crisp tempura uses Riviera fish and vegetables and comes served with a bonito and soy broth. Sweet, earthy langoustines are accentuated by oven-dried langoustine powder, and the scallops have a subtle froth of green-tea emulsion. Then there's Robuchon's favorite Japanese dish: rice with melt-in-your-mouth donburi (poached egg), nori (seaweed) and uni (sea urchin). The mix of Japanese tradition and French refinement isn't confined to the plate. French interior designer Didier Gomez, known for his work with Ferragamo and Louis Vuitton, created the restaurant's slick, serene look, and key to his design is the intimate (10-seat) sushi-sashimi bar serving locally caught fish. Entry to Yoshi (www.metropole.com) is via a small hallway with a stone waterfall and a glass partition separating off the kitchen. 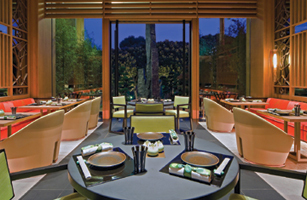 From their seats, diners can see the minimalist Japanese garden reflected in the mirrored and bamboo-latticed walls, harmoniously blurring inside and out. "I wanted a contemporary vision of a serious Japanese restaurant with a lighter, more feminine Zen-like mood," says Robuchon. Gastronomic nirvana indeed.